I don't know about y'all, but I'm SO ready for fall. I'm sick of sweaty commutes to work and the miserable humidity we've had in Chicago this year. Don't get me wrong - I love the sumer, but I'm ready to bring out my jeans, boots, and adorable quilted jackets. When I heard J.Crew came out with their new line of quilted jackets and vests, I jumped to buy this jacket and the coveted herringbone vest. I can't wait for them to arrive and for the weather to (significantly) cool down! 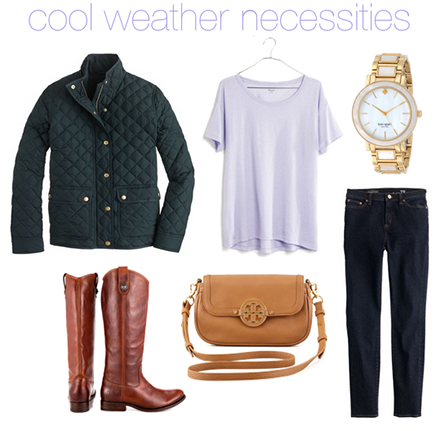 What fall-friendly apparel item are you looking forward to bringing out of your closet? I love quilted jacked! I own a quilted puffer vest myself! That quilted jacket is to die for!! I might need to get my hands on it ASAP. I definitely agree, I need the cooler weather. amen! i can't wait for summer to be over! That jacket is gorgeous - definitely going on my birthday wish list! Love the watch! Great look! That quilted jacket is perfection! Cotton Quilted Jackets is a perfect outfit in winter season. When you wear quilted jacket, you may look smart and stylish. It is now cold here in the Chicago area and I am looking for riding boots. I found some at the Bloomingdale's Outlet and like but so want to love. I have to find some that have a wide calf because of wearing a compression garment on one leg.